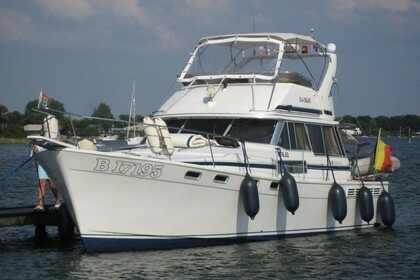 PRICE DROP: 'Isla Shamu' is a Bayliner 3818 EL from 1988. Since 1992 it has been the proud property of one owner. This Super wel maintained yacht runs like a beauty. It has a full maintenance history and logbooks. It has sailed on mainely on the North Sea but now it's docked on freshwater. The interior was changed in 2010 (new upholstery, fridges, toilet). The generator had a revision in 2011. The Flybridge is very spacious and gives you a super view to navigate. There is room for 4 persons. Each cabine has it's private bathroom. FROM 57900 EUR TO 34500 EUR. Owners wants to sell.